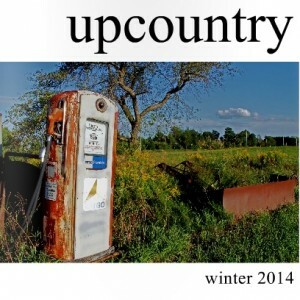 The staff of the University of Maine at Presque Isle’s online literary journal Upcountryhas finished its last round of editing and the latest issue—Winter 2014—is now available for viewing in its interactive online format. Dedicated to showcasing poems, short stories, personal essays and visual art from the campus and local community, Upcountry is a publication of the University’s English Program. Presented both in print and as an interactive, online format, the literary journal is published twice yearly. The journal’s advisor, Dr. Melissa Crowe, said that, in this issue, she and student editors Jessica Edney and Kayla Ames have worked hard to include a wide variety of fine work, both from returning contributors and writers new to the journal’s pages. “We think the magazine is truly gaining traction in the wider community, both in terms of the quality of submissions we receive and in terms of a growing readership. We love sharing the talent of Aroostook County folks with people here at home and with the wider world, and that’s precisely what the online format allows us to do so easily,” Crowe said. 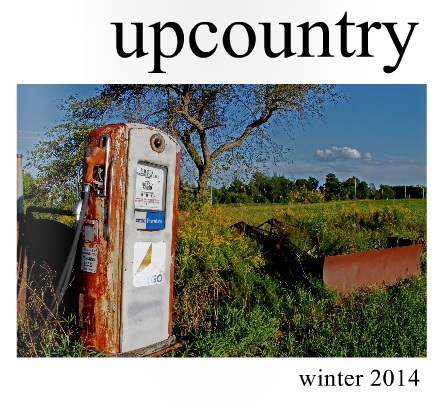 The Winter 2014 issue of Upcountry features the work of 15 writers, poets, photographers, and artists. Works range from Ian Covey’s poems “Water Street” and “To the Lighthouse” and Chris Morton’s essay “Destiny, Damp-Dry and Learning to Try” to Alice Bolstridge’s story “Feeding the Animals” and Richard Zuras’ poem “Students at a Poetry Reading.” Carolyn Anderson’s photograph “Farm Fuel” graces the cover. The issue is again being made available in its interactive format. Issuu, an online publishing platform used by the staff since 2011, gives viewers a more hands-on reading experience. The platform allows pages of uploaded print material to be viewed much like a traditional printed publication, with animated, flipping pages and left-to-right page viewing. To view the latest issue of Upcountry in its interactive format, visit http://upcountryjournal.wordpress.com/ and click on the “Expand” button. For more information about Upcountry, please contact Dr. Crowe at upcountry@maine.edu.